Individual businesses will have special events and sales that day, with some extending to Friday and Saturday. “Elfing” will be underway at various times throughout the Christmas season. From Nov. 17 to Dec. 22, Christmas elves will be roaming the streets, handing out Chrismas coupons, Chamber Bucks and gift certificates from participating businesses. Cookies and hot chocolate will be served in the downtown mini-park on Thursday evening, 5:30 to 7:30 p.m., and several businesses will be open for extended hours. The cookies and hot chocolate at the mini-park will continue on Dec. 1, 8, 15 and 22 in combination with special chamber-sponsored events. The Taste of Albion, a wine tasting and art show featuring area artists, will be held Friday, Nov. 18, from 6 to 8 p.m. at the Albion Public Library. Appetizers will also be served. Advance tickets are now on sale from the chamber, the library and at local businesses for this event. This is a fund raiser event for both the library and the chamber. The “Turkey Trot” 5K run will be held on Thanksgiving Day, Thursday, Nov. 24, starting at 8 a.m. from the downtown minipark. This event will be held regardless of weather conditions this year. Registration will be held at the mini-park in advance of the run. 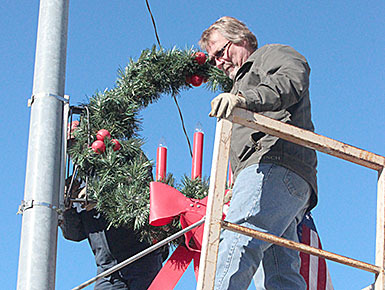 Curt Berglund and Steve Gragert installed Albion’s downtown Christmas decorations on Sunday, Nov. 13.